BRYAN EATON/Staff photo. 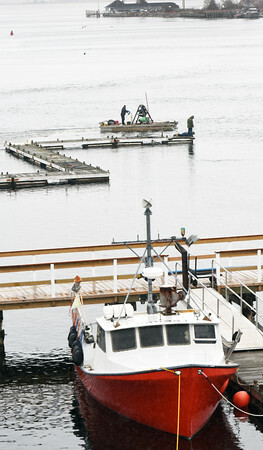 Despite the snow spitting on Monday morning, a crew from Ring's Island Marina in Salisbury started setting docks in the Merrimack River as spring slowly takes hold. They'll have to deal with rain today and Wednesday with the chance of a thunderstorm as a cold front moves through later on Wednesday.